Maybe it would be more appropriate to start with a long silence. Because the applauses for this triumph were only a huge adrenaline rush, following generalised catharsis. Because Parsifal’s music reached all the objectives Wagner had imagined when he subtitled it “A Festival Play for the Consecration of the Stage” (ein Bühnenweihfestspiel), mainly in this last act, where the hieratic and the redemption are the main theme… I was there. Maybe this is all one could say. A strange coincidence: the season of “George Enescu” Philharmonic Orchestra also started with Beethoven’s 9th, conducted by Christian Badea. And the series of his concerts at the Athenaeum for this season also ends with Parsifal, only the 3rd act, in a semi-staged version. As the performance will take place on Friday, too, I do not want to disclose now too many details of this conception. I will return tomorrow to this part. I will only say that “semi-staging” is reductive only at first glance. The truth is that the theatre gets one more degree of freedom, as the Romanian Athenaeum itself is a temple: the column at the entrance are nothing else but a Poryplaea, the rotunda is, practically, a real copy of the temple of the Grail as it appeared in its first production at Bayreuth, in 1882, supervised by the composer, and the big, round auditorium under the dome does nothing else but extrapolates and stresses this metaphor concretely transposed in a monument of architecture. The Romanian Athenaeum is the scenography for this Parsifal, and Christian Badea’s staging concept completely uses all its artistic opportunities, and produces an amazing synthesis between the classicality of Paul von Joukowsky, the set designer of the opera creation, and the modernity of Wieland Wagner, from the rebirth of Bayreuth, in 1951. Christian Badea was much more than just the conductor. He was the maestro of the entire performance: he directed it, he was its musical director, he brought on the stage of the Athenaeum some top Wagnerian voices, he took the chance of a unique cast, without safety net, and lived the agony of a last minute forfeit (Perencz Béla stood in for Levente Molnár, who had cancelled). Christian Badea made a crazy bet with the theatre and he won it, with Maia Morgenstern. He found sponsors, he galvanised an institution usually so passive, he contaminated everyone with this project, until the Romanian media, generally so insensitive to cultural subjects, simply surrendered to him. He was everywhere. But most of all, he was at home, in Wagner’s music, his “drug”, as he confessed. Starting yesterday, Wagner’s music is our drug, too. Christian Badea was at home, in his country, where no one is a prophet, where recognition is so hard to conquer, even though it seems of so little importance if compared to the size of the lyrical planet that he has travelled until now. He conducted with a passion that burned all the reservations one could have had. This man has such a thorough knowledge of Wagner’s creations, that he was irresistible. We are already used to his conducting – energetic, but very well balanced, it made the Philharmonic Orchestra show its incredible artistic resources, that allow it to bravely compare to any other European or American musical forces. Such overwhelming brass chorales! Such string quartets of absolutely incredible force! An oboe solo anticipating the symphonic moment of the Karfreitagszauber: real poetry, that could make even stones cry! And the tension he had so rigorously balanced (the orchestra never crushed with its sound, even if it was in complete format and it had an authentic symphonic sound) exploded in an immense catharsis: the march in Mittag. The chorus! For once, they sang without a sheet music, and this made them a part of the whole, in a different manner than the usual one. This was obvious also in their diction (because there is a difference, very clearly heard in this Parsifal, between wer and wehrt), and in their persuasive singing, as if they were opera veterans. As for the moment when the chorus enters… it is clearly a height reached by Wagner, but it was also a height reached by Christian Badea, the director. All these were made possible with means that seemed ridiculous from the theatrical point of view, but were astonishingly efficient. What makes Parsifal unclassifiable is precisely Wagner’s obstination to make it neither an opera (it is too statical), nor an oratorio (it has an indisputable theatrical force), and not even a symphony with voices (because the instruments alone are not enough). I should start with Stefan Vinke, a wagnerian tenor with a lyrical voice, ideal for Lohengrin, but who, in Parisfal, combined a dignified declamation with a disarming musicality. His suave high notes, as in belcanto, together with forced passages, at unison with the orchestra showed what this role means. But the 3rd act belongs to Gurnemanz. Eric Halfvarson was ideal: his part is that of a spiritual leader who has seen a lot, he is a member of the old guard and the age is the only thing that prevents him from doing wonders, therefore he becomes a hermit. And the artist Halfvarson himself is a definition of the “old guard”, capable of being at the same time Fasolt and Fafner, vocally speaking: a basso cantante or a basso profondo, according only to his will. His monologue simply filled the dome of the Athenaeum with his low, dark voice, moving between toughness and emotion, he played wisdom, he lived the revelation and, finally, he amazed us all. Perencz Béla, who arrived in Bucharest only on Wednesday afternoon, just in time for the general rehearsal, showed a self-confidence that only experience could give, and he fitted perfectly into the team. It is true, Amfortas’ part is small in this 3rd act, but it is important: without him, we would not have the redeeming end imagined by Wagner. Maia Morgenstern was at the height of her legend, earned after the movie “The Passion of the Christ”. And at the Athenaeum, her eyes spoke far beyond Kundry’s cries, as only a great actress’ eyes can tell the story of a character that comprises sin and forgiveness in a mixture that has remained unique in the history of music ever since. What could I add? It is already a long line of dithyrambs. But the encomiums are inevitable, because Parsifal is a meteor in Romania. All around the world so many things have been said about this opera, so many interpretations have been given to its libretto. Wagnerians speak passionately and immoderately about this music. And I will be no exception. Parsifal choses you and maybe it is a kind of barometer for Romania. Act III was given at the Romanian Athenaeum in 1915, with Enescu conducting, exactly 100 years ago. Then came George Georgescu, at the National Theatre (the National Opera was in the same building at that moment), in 1932, full version. 83 years ago. These years comprise the evolution of Romania towards a normal civilisation, whose measure is given by art, too, and, in this case, it is given by music. 50 years of communism chased Parsifal away from Romania; as for post-communism, the performance in 1998, at Enescu Festival, was a huge audience failure (in fact, the concert was very good, with high-class musicians, all foreign guests). We had to wait for 2015 in order to have a Parsifal in Bucharest that created in the public the same emotion that people in the most important opera theatres all around the world live at least once a year. And, from this point of view, the purifying music of this opera, that started yesterday in complete darkness and authentic piety, could show the level of the society’s normalisation, a society that has missed Wagner so much. But, be careful, it is only the 3rd act. Will the time come for the entire opera? This might depend on us, even more than we could imagine. Funding a high quality performance is not an easy task, especially because we do not have a tradition in heroic voices, which are hard to find everywhere nowadays. A first step would be to come tomorrow as many as possible to the concert. Then… a Wagner society, why not? A club. And the system will give up eventually. I am sure of this. In the review I wrote after the concert on Thursday, at the Athenaeum, I promised I would return with details about the stage direction of this 3rd act of Parsifal, by Richard Wagner. 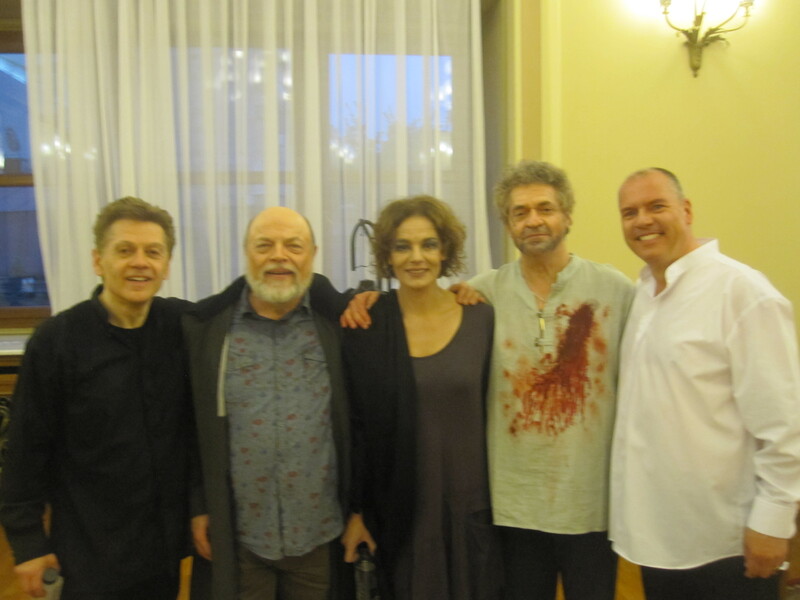 I discussed with several spectators who discovered Parsifal only this week, at the Romanian Philharmonic: they said they would like to see a full production of Wagner’s last creation. A very normal and logical wish. I dare say it would be extremely difficult to produce a performance as interesting as the one we had at the Athenaeum. The “semi-staged” label that was used for this event is simultaneously true and false. Yes, it was semi-staged because there were no scenery, no props, no ancient costumes. But it was fully-staged, because the Romanian Athenaeum was an almost authentic scenery for the representation of the temple of the Grail knights, and Christian Badea used its theatrical capacities to the maximum, in a surprising, but coherent, almost ideal way. Wagner wished to be a total creator in Parsifal. He composed the music, he wrote the libretto, but he also gave very precise indications for the staging of the opera at his own theatre, in Bayreuth. At that time, the role of the stage director was not well defined yet, but there were artists who did the scenery and the costume design, according to their own ideas and experiences about stage representations. Wagner chose Paul von Joukowsky, a Russian painter who had never worked in theatre before, exactly because he did not want him to interfere too much with his own ideas. Parsifal is difficult to stage, because the action is statical, and the main characters are more witnesses of dramatic situations and less protagonists of different actions. For example, in the 3rd act, Parsifal’s return to Monsalvat is the occasion for Gurnemanz’ extraordinary monologue, that ends with the funeral procession of the knights who bury King Titurel and urge Amfortas to uncover the Grail. The movement is almost inexistant and still, music pushes the dramatic tension of some moments up to paroxysm. Over time, many directors have failed with Parsifal, exactly because they did not have inspired staging ideas that could make a dramatic performance with these statical scenes. The solution is to create an atmosphere where light and sound are the real staging. At the Athenaeum, the orchestra members and the conductor were dressed austerely, with black shirts, as it usually happens for an oratorio, like Matthäus-Passion. At the beginning, the auditorium was in complete darkness, and the audience did not see Christian Badea coming to the podium. This “waiting for something” produced a dramatic atmosphere in the audience, but it also urged them to have a serious and curious attitude. Then, the only lights were those on the stands – the prelude to the 3rd act was played in half-light. On the two prosceniums there were frames: on the left side, Kundry was dressed in a simple dress and wore a veil, like in classical productions, on the right side, Gurnemanz, with a walking stick and an overcoat, the knight turned into a hermit, but with a contemporary look. Parsifal’s entrance was cinematic: he entered from behind the audience, on the corridor taking to the stage, towards Kundry. Parsifal wore a jacket with a hood, and a spotlight projected his long shadow. Kundry watched him intensely, almost without moving, and keeping the slow cadence of the music. The chorus entered through the two doors near the stage, then they sang on the circular lane at the boxes level. Parsifal’s holy spear was a pencil of blue light rays, and the unveiling of the Grail coloured in red the dome of the Athenaeum. 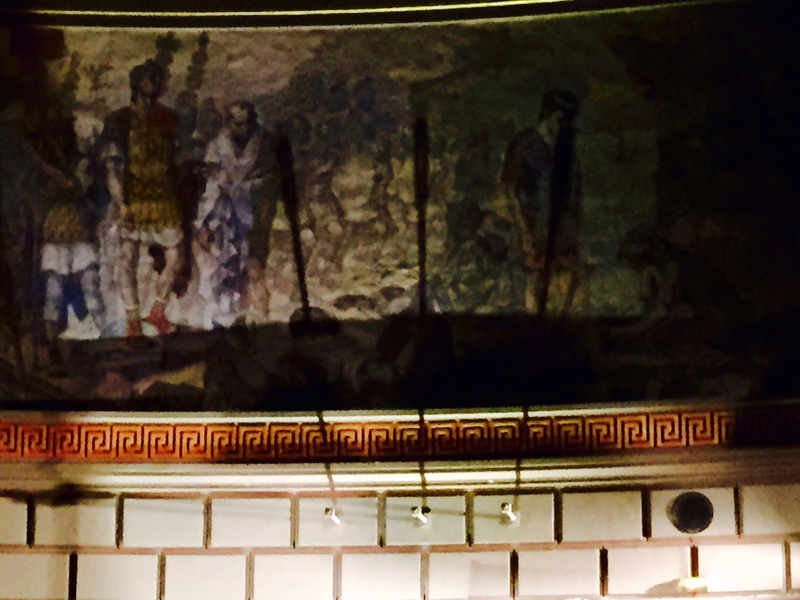 The final chorus was placed in the rotunda in the foyer, under the auditorium. 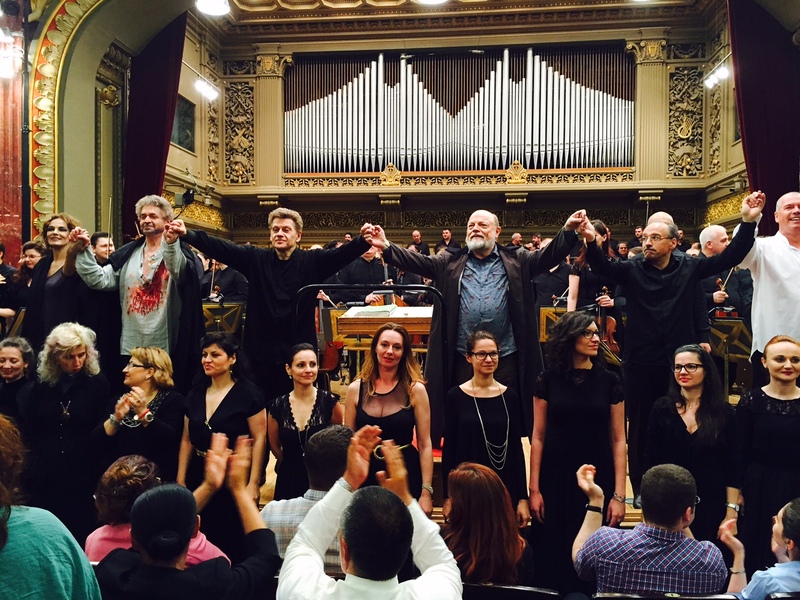 The result was an immersive and unconventional performance, the audience lived an experience similar to Andrei Șerban’s The Trojan Women, the only difference being that the spectators did not move and the artists played and sang among them. But, in both cases, breaking theatrical conventions was the trigger of the catharsis.